It sounds odd to call Taro my student since he was eighty-seven when he died and already over eighty when he started attending my English class. He was old enough to have been a soldier in World War Two—a very young, near-sighted, and perhaps slightly eccentric one. I can report that although Taro’s English was slow and halting, he didn’t make many mistakes and he could say what he wanted to say. He did not, however, participate in discussions. While the other students related their ailments, holidays and grandchildren, Taro sat still as a statue, without seeming to move even his eyes, so becalmed you could be excused for thinking that he’d maybe gone a little soft in the head. If it sounds like I wasn’t a very good English teacher, that’s the truth. I was lazy. I was too tired and too busy, like everyone else in the city of Tokyo. On the plus side, I was not very important in the lives of my students. A focused and energetic English lesson would only have gotten in the way. I was just an excuse. I was an excuse and I knew it. Just as the English language was an excuse. Tokyo is the number one loneliest city in the world: I will arm-wrestle anyone who says otherwise. But these old people, sitting in a community center beside Akagi Shrine in the elegant district of Kagurazaka, were not lonely. They were having a good time and, if their grown grandchildren sometimes laughed because grandma was taking English lessons, and maybe had been taking English lessons since the Occupation though her English never improved much and she continued to say “I go to shopping” despite being corrected three times every Wednesday, still, I’m telling you, these old people were clever: they knew a thing or two about living. Just because some people remain immune to wisdom all their lives does not mean that wisdom can be ruled out. Some people do become wise in their old age and some of those people, it turns out, go to English class, even when they are eighty-five years old. Whenever I called on Taro, his magnified eyes would blink behind the heavy lenses of his glasses and he would rub his lips together to moisten them. Then he would open his spiral notebook and cough to clear his throat. Using his notes to assist him—there were always a few words he’d needed to look up—he would tell the class a story. In my life so far, Taro is my favorite storyteller. If I tell you one of his stories, you will be disappointed and you will think that I am not a good writer. That is the truth—but I know, too, that I am not important and knowing such counts as a skill nowadays. Taro’s stories proceeded as slow as tortoises. A sentence was a creative endeavor and, as such, deserved its full allotment of time and space. Each sentence ought to be allotted its own page, as in the storybook of a young child. For example, when Taro traveled to Paris with his wife. They went to celebrate their 50th wedding anniversary. Taro explained that it was raining in Paris. They did not feel energetic. The chambermaid was a single mother raising two children on her own. She taught Taro and his wife to count to ten in French. At that point Taro nodded to the other students. They all smiled broadly to each other. I think it actually pleased them that their American teacher understood nothing whatsoever about life. It was a long time before I understood that . . . nothing special needed to happen. Taro and his wife went to Paris to celebrate their golden wedding anniversary. It was raining and they didn’t feel well. They stayed in the hotel and the friendly chambermaid taught them to count to ten in French. That was it. And that was enough. Or the time Taro found a dead cat on his roof. A cat corpse saturated in cooking oil. Taro’s wife thought she smelled something. Taro got on his ladder and, sure enough, there was a large dead. oil-soaked cat on the roof. There were a lot of restaurants around where he lived. They poured used cooking oil into a barrel, but they didn’t always put a lid over it. The cat must have been lured by the smell and fallen in, then been overwhelmed when it tried to clean itself. For that matter, what the hell was an eighty-five year old man doing on a ladder? Again, Taro looked to his classmates. Again, the knowing smiles and nods. Like I said, I think they really appreciated the fact that I could be relied upon to be dumb and insensitive. The point was not that the cat was disgusting—it was all just interesting. Whether it was a dead cat on the roof or learning to count to ten in French, here was reality, and Taro attended to it. Nothing bad ever happened to Taro. I was his teacher for years and I can attest to the fact. Nothing good happened either. Everything was just interesting. Whatever it was, he took care of it and wrote an account in his notebook, always with a few new words which he forgot almost as soon as he looked up from the page. What a very interesting world it was. For example, it was interesting that he was constantly being arrested by the police. As a young man he’d never been arrested, not even once. Now he got arrested all the time. This was because of his bicycle. He liked his bicycle very much, although it was just the ordinary heavy kind of bicycle which the Japanese use to get back and forth from the grocery store. He had built it himself, from the parts of many different discarded bicycles, and it was several different colors. In Tokyo, when something breaks, you get a new one. Even if just one small part is broken, you get a new one. It is not usual to fix something, much less to make something from what others have discarded. The police took one look at Taro’s multi-colored bicycle and assumed that he had stolen it, part by part. They put him in the squad car, drove him to the station, and accused him of being a bicycle thief. It took him a long time to convince him that he was just a person who liked to fix things. This happened multiple times. It happened so often that the police chief, the moment he saw Taro, would rush over and start apologizing. The chief would apologize profusely, then lay into the patrol cop for having nothing better to do than accuse an octogenarian of stealing a bicycle. The truth was Taro didn’t mind. He didn’t mind being arrested any more than he minded finding a dead cat on the roof or traveling to Paris. He was not at all displeased. He was not neutral either and certainly he was not unfeeling. Taro lived to be 87. He was a painter and a teacher of art. For half a century he participated in annual exhibitions. His canvases were abstract and enormous and people who saw them invariably said that they seemed like the work of a much younger man. As often happens in Japan, his final illness was hardly discussed. He retired from English class, then returned to it. Death, he said, would come when it was time -- it was not necessary to wait for it at home. Taro lived several years longer than the doctors expected. Despite long friendship, no one in the English class was told he when he took turn for a worse, nor was anyone notified when he died. Someone heard of his death from a neighbor, a few weeks or a month later. This was neither unexpected nor rude—it is how death is done in Tokyo. It is considered polite to just slip out and not make such a fuss about it. If there was a memorial service, none of us heard about it. It is not known, either, what has become of his paintings: they were so sprawling and ambitious that almost nowhere in Tokyo could a space be found to display them. Jonathan Mack was raised on a family farm in New Hampshire, but has spent most of his adult life in India and Japan. Stories and essays have appeared in Green Mountains Review, Quarter After Eight, Eleven Eleven, Gargoyle, Epiphany, Zymbol, Hippocampus, Mary, Jonathan, Quick Fiction, The Tokyo Advocate, Japanzine and elsewhere. His blog is Guttersnipe Das. We are very pleased to share that a writer we featured in our first year at bioStories, Loukia Borrell, has a new novel out. 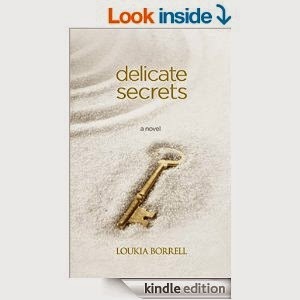 DELICATE SECRETS is part of Borrell's Aphrodite's Anthology series. To learn more about the book or to order it, follow the link on the title. You can follow Borrell on Twitter @LoukiaBorrell. My fingers dig into the faux-leather steering wheel as I point my right foot to the ground and the engine roars with exertion. One thought goes through my mind, “What the heck am I going to do with this kid? !” The windshield wipers’ squeaky objection snaps me out of my trance and I slap my hand up quickly, turning the wipers off. The rain has finally stopped. The word, “rain,” gives more credit than this annoying drizzle has earned. We moved to Washington from Texas three months ago and the constant mist is as annoying as gnats in your face when you’re trying to enjoy a picnic. At least in the dry Texas heat my hair didn’t frizz. Of course, I haven’t had my hair down much here where it can frizz. I’ve been working long hours preparing for this deployment and being in the uniform means my hair is up in a tight, strict bun. Again I’m jarred out of my ranging thoughts as I make a quick right turn and my truck fish-tails into the empty left lane. “Oh, crap,” escapes my lips as I’m barely able to keep from spinning out. I release my foot from the accelerator. I remind myself I still need to learn how to drive on these slick roads. I try to calm my anger and anxiety and take slow, deep breaths. The full scent of the lush greenery is calming in its backwoods way. The beauty of this unfamiliar state is undeniable as I admire the silent giants lining each side of the road the whole way home. I make the last turn into my neighborhood and take time to back slowly into my driveway. This is a last ditch effort to provide time to calm down. I walk to the door and hesitate at the lock. I have my key out, but if it’s unlocked, then that means my theory was right and he’s inside. A slow turn of the handle, and yes, the door opens easily. All the calming efforts from the drive are left outside with the persistent mist. I stomp my boots loudly on the new welcome mat and slam the door behind me. His reluctant steps are magnified in the silent house as he trudges slowly down the stairs. Our little dog trails silently behind him as if she’s in trouble too. I stand in the entry-way, jaw grinding, and watch as he slides his hand down the rail and takes the last step onto the wood floor in front of me. He stares at the floor and shrugs. He’s still wearing his school uniform and he pulls his collared, baby blue shirt down in a nervous motion. His khaki pants have a doodle drawn on the left knee in pen that I think will take me forever to wash out. I sigh and tell him to go sit on the couch. I take my uniform top off and hook it over the stair railing. With my dog tags clinking under my tan t-shirt, I follow behind him and sit on the couch. “Jaden, you have to tell me what’s going on,” I say as patiently as I can manage. He sits all the way back on the couch, his white-socked feet barely touching the ground as he slouches and folds his arms over his chest. I feel the irritation rising with the growl in my throat. When I yell at him his head jerks up as if I’ve slapped him and his dirty-blond hair bounces off his forehead. Again, he says it’s nothing. He apologizes and says it won’t happen again. Suddenly I’m exhausted and I rub my hands over my face as if I can just wipe away the fatigue. He walks off slowly and I head upstairs to my room. As I sit on the padded, wooden bench at the end of my bed, I call the principal to let him know Jaden is home. I apologize and thank him for informing me of his absence. I sigh as I hang up the phone and start untying my boots. Leaned over, fingers tugging on laces, I notice a shadow cross slowly in front of me. I sit up and Jaden is standing silently in the doorway. His shoulders are hanging heavy and his head is down. He looks up slowly and his eyes are full of unshed tears. He looks so weighed down with a burden he hasn’t shared with me that I’m immediately concerned. It’s like a wave crashing over him as he releases his held sob and the tears flow freely down his lightly freckled cheeks. This one sentence, spoken from this eleven year old boy, hits me so hard I feel my heart shattering under the pressure. Jaden was exactly one year old when I met him. He was sitting on his grandmother’s kitchen table in Kentucky, playing with his aunt and grandmother when I walked into the house with his dad that first time. This was the first time meeting my boyfriend’s family and I didn’t have much experience with kids. I barely liked them from a distance. Jaden was an adorable butterball wearing just a diaper and a small, blue onesie. His eyes fixed in wonder at this new person in his home and he turned back to his grandmother for guidance. Jaden turned to me with a huge, unabashed smile. Then, to my horror, he launched himself into a sprinted-crawl and, giggling wildly as if at a joke only he heard, crawled as fast as his fat fists and knees could carry him towards the end of the table; right where I stood. Without any warning or hesitation, he threw himself into my arms. I was truly terrified. I was twenty years old and had no idea what to do with a kid. Now I had one literally throwing himself at me! I thought of what could’ve happened if I hadn’t gone on instinct and just caught him. He’s put his life in my hands more than once. Ever since I caught him that first day, I’ve never let him go. When I married his father, Jaden was eighteen months old. He was adorable in his little tuxedo as he walked unsteadily down the aisle, carrying our wedding bands on a tiny pillow. When he was four he was bitten by a Brown Recluse spider in our home in Oklahoma. I stood in that emergency room, bawling my eyes out and yet trying to sooth him. Trapped in a memory I wish I could forget, I remember looking into his terrified, confused eyes and holding him down while he screamed so the nurses could clean out the wound. When he was six his biological mother stopped visiting him and after two years without even a phone call, he asked me why she didn’t love him. I fought back tears to reassure him that she loved him and she was just dealing with other things in her life right now. He’s never received another phone call and he’s never asked about her since. When he was eight my entire family threw him a birthday party at Peter Piper Pizza. His wish that year was, “I wish I could keep this family forever.” It’s horrible to think that at eight he was still expecting the rug to be pulled out from underneath him, as he wondered if this family was temporary. One day he came to me and asked if I would adopt him. I told him, “Of course!” We finalized the adoption when he was ten and we celebrate his adoption day annually like another birthday. He doesn’t get presents, but he gets to choose where we eat dinner and, of course, gets dessert. I never thought I wanted kids. When I met Jaden, he changed all that. Now I look at him standing before me. He’s already gone through so much in his short life. It seems so unfair that now he is standing here, in the shadow of the doorway, looking so defeated, carrying a burden no child should really ever have to carry as he says, “I don’t want you to go,” and I feel the familiar burn in my eyes as tears immediately rush in. I stretch my arms out and, like he did that first time, he folds his whole self into me, and just trusts. He’s much taller now. His baby fat long since stretched to fit his lean build. His feet easily touch the ground as he sits in my lap and I hold him close and rock him. I tell him I’ll be fine. I remind him of how fiery I get and I can take care of myself. He says that sometimes stuff can happen anyway. I remind him that even if something does happen I’ll be fine. “Why will I be fine no matter what?” I ask him. He whimpers, “Because God is taking care of you.” I tell him he’s exactly right. I tell him even if God says it’s time for me to go, I’ll still be fine. “I will miss you too. You are a part of me,” I whisper against his hair. My body still rocks him instinctively. He sniffles and looks up at me. “Now you’re crying,” he says with a slight lift in his voice. “Why, because now I’m crying instead of you,” I laugh past the tears. He gives me a big hug as my tears are rolling freely now. He gets up off my lap and stares down at me. I wipe my tears away with my hands as he does the same. Now I see a sly smile spread across his face. “I’m one of your soul mates,” he says, as if teasing a girl he’s just found out has a crush on him. “Yes, you are,” I reassure him. He stands there, looking at me like he has more to say. He hugs me again and bounces out of the room, no longer carrying the weight of his burden. I sit and think about this child who entered my life so unexpectedly. This child who has taught me so much about myself. I sit alone and let it sink in that every word I said to him was true and realize he needed to hear it as much as I needed to say it. Entries may be up to 3,000 words, must be nonfiction, and cannot be previously published. Entries should be submitted by pasting the essay directly in the body of an email addressed to: editor@biostories.com. The words “Elders Submission”, the title of your essay, and your last name must appear in the subject line. The body of the email must include the essay title at the top; no other identifying information should be included. All submissions will have identifying materials removed and be evaluated in a blind review by our editorial board. The contest entry fee is $10, payable via the Paypal button below (essay title to be entered as indicated). Entries that fail to follow contest guidelines or that do not include fee will not be eligible. Deadline for entry is February 16, 2015. All essays entered into the contest are eligible to be selected for regular publication in bioStories. The magazine will be open to standard submissions throughout the contest period as well. Visit bioStories to read past winners, all of our regular issues, and to submit. There was a blonde in our newspaper office who was supposed to be making nice with the boss. I'm not sure I believed this, but I disliked her enough to believe anything. I worked in the shop, washing presses, sweeping up, occasionally running small jobs on the Kluge Press, and she was billed as a reporter, something I could have been if only I'd gone to college. I'd been working for the paper since I was sixteen. It was my first job and it was fine for what I'd been hired to do, but I was never going to be promoted. Work at this print shop holds its own tales, but what I really want to tell here is the story of my wedding which took place in the summer of 1950, and very nearly didn't happen. The plan was to be married in July, a bad time of the year in those days before universal air-conditioning, but for a few weeks or so there seemed to be a good reason to get on with it. Then there wasn't, but the plan remained. At least until we broke up. Mary Virginia, who was to be my wife for the next forty-five years, had a romantic attachment to breaking up. She'd broken up with her high school steady shortly before she started with me, and she must have liked the feeling because she was always talking of breaking up, as if it was something sad that a girl had to do, sad but also quite stimulating. I blame it on religion. After eight years of parochial school, I "lost my faith" as the nuns liked to put it, and having lost it, had no desire to find it again. But Mary Virginia had not lost her faith, at least not yet. She wanted a church wedding complete with white wedding dress, bridesmaids, Dad in a tux, Mom in a gown, and flowers for all. This meant Mass, Holy Communion, and Confession, and no other possibility would do. "I guess this will have to be my ring." Stuff like that kept me married to her till death did us part. It would be nice if I could remember exactly how, after a sad lonely week, I found myself sitting next to that blonde at a bar. I hardly think I went out and picked her up, or asked her out, or anything like that. She was a plump little thing who strutted around the office, secure in her position, the boss wrapped around her finger, as my mother would have said, and I knew she looked down on me. But we were together, and we were drinking, and we were both alone. I was a kid, merely 21, but a decent looking kid, even if I didn't know it. How was I to know it? My father always said, "That's Paul, he's tall, that's all." Wouldn't my own father know? Whatever this blonde and I had to say to each other in this bar, I have no hope of remembering, no matter how interesting it might have been. For God's sake, it was sixty two years ago! But she did start looking and sounding like someone I could be friends with. Didn't I need a friend? If not her, someone like her—such a thought must have crossed my mind. And with that thought, it became clear that there were worse things in life than taking Holy Communion. What the hell was I thinking? Breaking up with Mary Virginia! Maybe she thought it was glamourous and dramatic to collect these sad, but delicious, failed romances, but here I was, looking at another reality. Very politely, I told the blonde, "I have to go now." I'm sure she soon found another gentleman to sit by her side. I'm very sure she liked him better than she ever could have liked me. I'm even sure those stories about her and the boss were never once true. And so, the wedding was back on. Arggh, the confession. "Bless me father for I have sinned. My last confession was . . ."
The priest must have heard this kind of stuff before. Why was I returning to the church, he asked in a dry, priestly tone. Because, I honestly confessed, I wanted to get married. And would I now be a devout Catholic, the mechanical voice of the hidden priest continued. Oh, yes, Father, the writhing atheist replied. My penance, I think, was to say the Lord's Prayer three times, and the same for the Hail Mary. It was a wonder bolts of heavenly lightning did not strike us both on the spot. But in any contest between love and faith, between love and almost anything else, love always wins. Don't quarrel with me, I know it is so, at least for me. I can't say I was pleased, being put through this process, but, darn it, somebody had to be the adult here and, of all people on earth, an atheist should be able to lie to a priest—or why be an atheist at all? There was more to come. The reception. Her father, an honest railroad worker, joined the Blue Island Elks Club solely that he might host his only child's wedding reception in the Elk's Hall. Did he not know that my father worked for the Elks, was in fact a lowly janitor, called a "steward," who would have to clean up this very hall the next day? Yes, he knew, but he could not imagine why a little thing like that should trouble me. Old Fred Klemmer was going to be quite a father-in-law. It was going to take at least ten years for me to learn to love him. He liked his Jim Beam and Dutch Master cigars, and he had regular fights with his wife that I thought were almost comical compared with the battles my own parents had. These people had pretensions. She belonged to every woman's club that would have her, and that seemed to include them all, and he was the same way, trying to run the Order of Railroad Conductors, and the Knights of Columbus, although they never exactly let him do it. You might say he wasn't quite educated. Neither then was my father, but at least my father read books and knew how to play the piano. Never mind, Mary Virginia loved old Klemmer so much everybody wound up calling her "Klem" to the last day of her life. That's how we have it on her tombstone. 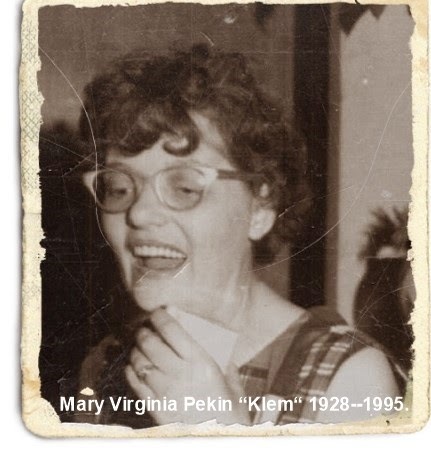 Mary Virginia "Klem" Pekin. Now that I've told you that, I will stop speaking of her as Mary Virginia which was only some name her mother picked out of the society pages. The wedding was set for July 15. My mother-in-law to be wanted to set it back into the fall when the weather was more clement. But it was too late. The wheels were rolling. Much of this stuff is hard to remember. The wedding party, for instance. I'm not sure if my little sister Nancy was the maid of honor, or the second in line to the maid of honor. I know the best man was a friend of mine named Bill, not so much a best friend as a friend who was Catholic, for that was the rule. My real best friend, who did not seem to have a religion at all, could only be an usher. After the wedding Bill and Nancy "dated" a few times, which I thought was wrong of him because she was barely sixteen and he was over twenty and should have been pursuing girls his own age. Never mind, she soon disposed of him, and as she grew older, found much worse choices than good honest Bill. There is really no sense in worrying about the boyfriends your sisters choose. Neither of my sisters ever asked my advice, or had any problem doing without it. I remember my mother wore a dress that made her look larger than she was. This was usually the case, and no doubt my father did not overlook the opportunity to say as much. My mother and father, that was a sight to see, the two of them dressed up for my wedding, standing side by side, just as if they didn't fight like cats and dogs every chance they got, and were only biding their time before they started again. This is what love does to a young man, convinces him that at least in his case, life will turn out differently. Because I couldn't drive a car in those days, my friend Archie provided the wheels. This was my true best friend, who just died last summer at the age of 84. He had tried to teach me how to drive, several times, but couldn't do it. I kept turning the wheel in the wrong direction, and that made him nervous. So he drove, and my friends from work tied a bunch of empty ink cans to the back of his car while the ceremony was going on. The ceremony itself was a full scale Catholic Mass, and the way it was done in those days, with bells and incense and altar boys, was meant to remind you that Mass was more important than your wedding. For some curious reason, before the wedding actually began, the male members of the party were kept out of sight in a little room behind the altar which I believe was called the sacristy. How long we sat there is something that never got fixed in my memory. What I clearly do recall is an open door that looked out on the schoolyard and beyond, all the way down to the east side of town where many green trees gave an illusion of endless freedom to anyone who had courage enough to flee toward them. My last chance, I thought, and then I went where I was supposed to go and got married. We drove around afterward, and Archie stopped and took the ink cans off his bumper as soon as possible. He was very particular about his car, and feared one might bounce up and scratch the paint. We stopped in my favorite tavern and had a beer with my favorite bartender, who, like every other male friend I ever had, instantly fell in love with Klem. She had a way with men, I tell you. Before we were married my pals would serenade her by singing "Oh, my Darling Clementine." On nights when she stayed home to wash her hair, I would call from the bar, hold out the phone, and they would sing it for her. Wedding receptions, in Blue Island, were great occasions for people to get drunk. I'd never left one sober before, but this time I made a point to. That old railroad man, Fred Klemmer, made up for me by disgracing himself, or so I heard. He and my mother-in-law had such a row that night they didn't speak to each other for days. My own mother, who always loved a good party, may have become a bit jolly too, and my sister's husband, one of the finest men I have ever known, went down for the count. In those days, what you were supposed to do after the reception was to slip off to some hotel and consummate the marriage in a fancy room before leaving for your honeymoon. But Klem and I already had an apartment waiting on Grove Street, and we had Archie, sworn to secrecy, drive us there. We would start our honeymoon Monday, and we hadn't the slightest idea where we would go. Serendipity was the thing. We went straight to bed, woke up the next morning and, instead of going to Sunday Mass, consummated our marriage for all we were worth. Then we walked the seven or so blocks it took to get to her parents' home where the old railroad man and his seething wife were sitting in silence on the front porch, thinking we were on our way to some faraway honeymoon place. Suddenly, here we were, as if nothing had happened at all, and there was nothing else they could do but invite us in for lunch. So, we may have saved their marriage, or at least got them to speaking to each other again. Good old Fred Klemmer. Some day I'll write about the trip we took to Pittsburgh to see his relatives, just the two of us, and how we rode the famous Monongahela Incline. That was my wedding. Monday morning we went downtown and took the first train out of Chicago which happened to be the train to Detroit. And that was our honeymoon. On the train I ate in a dining car for the first and only time in my life. In Detroit we found a room in a hotel that had seen its best years long ago and had no hope of ever seeing them again. Across the river in Windsor, I was thrilled to find myself in another country. My bride was a much more sophisticated traveler. She'd been all the way to California in a Pullman car when she was only 17, all by herself, playing gin rummy in the club car with a gentleman twice her age. Canada, I feared, might be small potatoes to her, but she eagerly scooped them up all the same. One afternoon in a little pub that had a separate room where women were supposed to sit (and where she most certainly did not sit) we made the acquaintance of a ruddy-faced man who told her he had been, in days gone by, the middle weight boxing champion of Canada. He and his ruddy-faced friends insisted upon buying one round after another of strong Canadian beer until at last everybody was very very drowsy. From Detroit to Canada and back, we had a happy week, as good as, we thought, any tropical isle. On our final visit to Windsor, we bought a bottle of Bushmills Irish Whiskey, and carried it back to our little apartment on Grove Street where it sat in our pantry for quite a long time, almost too precious to drink. Oddly enough, I have no idea whatever became of that blonde. Born in 1928, Paul Pekin currently draws a pension from the Cook Count Forest Preserve Police, the last of a succession of jobs that included teaching Fiction Writing at Columbia College of Chicago, English Composition at the School of the Art Institute, owning a little mom and pop store on Diversey Avenue, and working as a letterpress printer back in the days when there was such a thing.